Since bottled and tap water both come from the same local water sources, the water should be the same. However, the Federal Drug Administrated (FDA) administered bottled water industry generally provides a lower lead content. 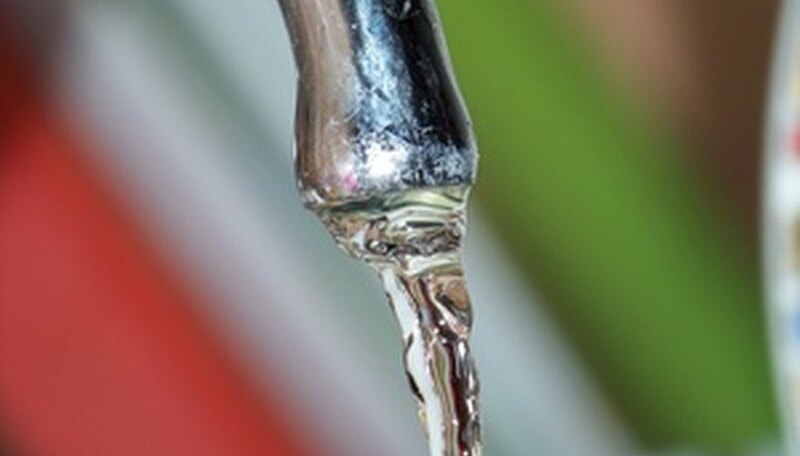 Tap water, controlled by the Environmental Protection Agency (EPA), has slightly higher lead content from passing through the pipes, has traces of bacteria-killing chlorine, and fluoride for stronger teeth. Check out a few ways to test for other differences. Compare cost by figuring out first how much it would cost to drink eight 8-ounce bottles (64 ounces or 1/2 gallon) of water per day. Next find the cost of water used at home for one month. Use this figure to find the cost per gallon for tap water. Divide that number in half to find the equivalent cost for 1/2 gallon (64 ounces) of tap water. Compare the prices for 64-ounces of tap water and bottled water. Tap water is supposed to taste different than bottled because of the chlorine. Try giving several people three different four-ounce samples of bottled water and one four-ounce sample of tap water. All samples should be at room temperature and in the same type clear plastic cups, labeled with a marker as number one, two, three and four. Have taste testers fill out a water analysis form, rating smell, color, clarity and taste from 1 to 5 for each water. One being good and five being bad. First tally, then graph the findings to get a better idea which water is better . Tap and bottled water can be tested with pH, chlorine and nitrates/nitrites test strips, which come with their own color chart for comparison. Pour equal amounts (two to three ounces) of bottled water and tap water in clear containers. First, test each sample with 4.5 to 7.0 pH strips for acidity and then with 6.5 to 10 pH strips for alkalinity. After a few seconds the pH should read at or near 7.0 on the chart. Next, swish chlorine strips about three times in each sample, wait 10 seconds, then compare with the color chart. Results should fall in the 0.5 to 3 parts per million (ppm) range. Finally, dip nitrate/nitrite strips in each sample for about two seconds before comparing to the chart. An absence of color change indicates no nitrates/nitrites are present. Pour three ounces of tap water and three different bottle waters into separate clear cups. Test for calcium carbonate --- found in hard water --- with hardness test strips. Dip a strip in each water sample, wait 15 seconds, then compare the test strip value to the color chart. Extremely hard water samples may read greater than the maximum 180 ppm. In this case, add six ounces of distilled water so that the sample is diluted to 1/3 its original strength. Stir the water and retest with a new strip. Read the diluted water results and multiply by three to find the actual hardness of the water. Joan Whetzel has been writing professionally since 1998. She has written juvenile nonfiction, movie and television scripts and adult nonfiction. Her juvenile nonfiction has appeared in such magazines as "Tech Directions," "Connect" and "Class Act." She was part of the production team that produced the documentary "Fuel for Thought" on Houston PBS. She has also written articles for Katy Magazine Online. What Is pH of Sodium Carbonate in Water? Whetzel, Joan. "Science Projects on Bottled Water Vs. Tap Water." Sciencing, https://sciencing.com/science-water-vs-tap-water-7918905.html. 25 April 2017.